Pictured left is Gerard Way's installation piece for the gallery. 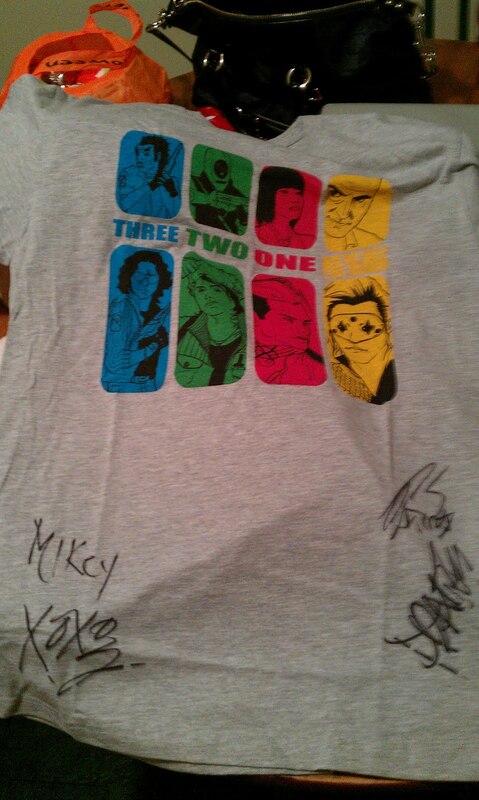 Thanks to themaskedman on Tumblr for sharing. Apparently, the individual landmines (60 in total) are being sold for $100 a piece. Gerard Way told Alternative Press in a recent interview that the piece he is contributing to the show is an art installation based on Metallica's "One," in the form of a fabricated pile of "quiet"-looking "destroyed, fragmented landmines." Thank you to Brittany for bringing this to my attention! Exhibit A Gallery announced that Gerard Way will be among the nearly 40 artists contributing to their "Obey Your Master: A Visual Tribute to Metallica" exhibit. Yesterday (or the day before yesterday, if you're going by New Zealand time), My Chemical Romance gave their first performance of Big Day Out Festival. Fans, early in the day, had been tipped off by those in attendance of the pre-show meet-and-greet that singer Gerard Way's hair was "orange." For whatever reason, despite our knowing Gerard will--if pattern can allow us to predict--inevitably make a drastic hair changes forevermore, the MCR fan community still goes wild over said changes. Unfortunately, due to the focus on aesthetic changes, not much of substance was shared during the show. In post-performance reviews, stuff.co.nz said that My Chemical Romance drew "easily the biggest crowd of the day [at the time of posting], and while the sound started on the dodgy side, they [had] the kids jumping and screaming like an audience should" while the NZ Herald said their performance was better than it was at BDO 2007, but the crowd was smaller. My Chemical Romance have released the video for "The Kids From Yesterday," their final Danger Days single in a very special way. "This song means a lot of different things to us individually and we hope it speaks to you as well. When deciding what kind of video would work the best with the song we immediately thought of a "video collage" ...something that would show the progression of the band over the past 10 years leading up to one of our most memorable moments, closing the Reading and Leeds festivals this past summer. We began collecting footage and literally stumbled upon an incredible video done by a talented young lady named Emily Eisemann. She had made a fan video, put it up on YouTube and it summed up what we had been trying so very hard to make, perfectly. So we gave her a call, put our videos together, and the rest, as they say, is history." 1. "If I Don't Sing"
4. "Get Yours While You Can"
5. "When I'm On Pills"
6. "Can't Have it All At Once"
8. "Love You No Matter What"
10. "Just to Feel Alive"
Prize: Meet-and-greet in Auckland, New Zealand on January 20. Requirements: Design a comic strip with your own Killjoys story. Be a Big Day Out ticket-holder. Prize: Meet-and-greet with My Chemical Romance; two tickets to a BDO show in either Brisbane, Sydney or Melbourne, Australia; and a signed Phant-o-matic Epiphone guitar. Requirements: Your own transportation to the shows. End date: January 17 at 10 a.m.
"I don't think we're going to be making any more videos, but something is definitely on the horizon," My Chemical Romance bassist Mikey Way revealed in a recent interview by Coup De Main magazine. For fans who had hoped for "SING"'s massive cliffhanger to be resolved, that may be disappointing. However, Way goes on to say that "the Killjoys story is far from over," citing that the Killjoys comic by Shaun Simon and MCR vocalist Gerard Way may contain hints at what happened to Kobra Kid and co. and that, "it should be relatively soon that you should hear something [new] about the comic." Though, who knows what "relatively soon" means in MCR time. 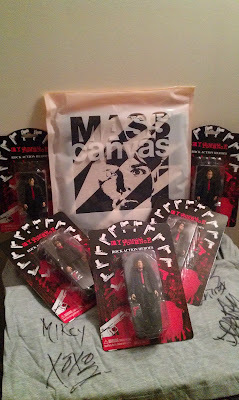 CONTEST: Win a set of My Chemical Romance action figures, a signed t-shirt or a MASScanvas shirt! 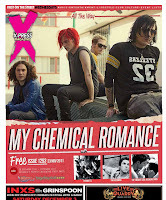 Thanks to amazing donations from readers and MASScanvas, I am so thrilled to be able to start off 2012 with a contest for my fellow My Chemical Romance fans! I know that for many of us, MCR's songs evoke a certain feeling or conjure imagery that flashes before us when we close our eyes while listening to the music. Choose an MCR song (Not a cover, please) for which the imagery in your head or for which your feelings are strongest, and describe what you see and feel when you listen to it in a comment below of 200 words or less (please adhere to the word limit!). *Note: I mean ANY form of writing. This could be a poem, a narrative, a small essay, anything--as long as it is within the word limit, it counts! As some of you know, I have been stuck in an abysmal state of Internet-less-ness since late November. As such, I have not been able to update as frequently as I would like. Those of you who follow me (@PoisonAndFire) on Twitter probably already saw these as they came out (thank goodness for my mobile Internet access, even if limited! ), but here is a re-cap of what has happened in the MCR news realm while I have been on winter break. In an interview with X-Press Magazine, bassist Mikey Way talked about the Danger Days... recording experience, reaffirms that they will "never add another member to the band again" (for those still wondering if their touring drummers will become permanent) and that they do, indeed, plan "to get together and begin the process of putting together a follow-up album....sooner rather than later!"